(Nanowerk News) High-end industrial and research applications rely on precision motion stages and systems to execute mission-critical procedures and processes. PI, a lead provider of nanopositioning and motion control solutions, has developed its new family of linear, rotary, and Z-axis stages to meet those demanding requirements. Meet the L-310 vertical stage, the L-611 rotary stage, and the L-511 linear translation stage. Rotary (L-611), Linear (L-511) and Vertical (L-310) Stages High Resolution, Multi-Axis. The new motorized positioning stage family is available with high-resolution encoders and a choice of stepper and servo motors. Lower cost open loop models are also offered, as well as vacuum versions. The use of high performance components makes these stages ideal for industry and research, especially in high duty cycle applications. Starting with the L-511 linear stage, available with travel up to 155mm vertical and rotary stages can be added to create 360° / XY / XYZ motion systems. The L-511 is offered with different drive systems providing smallest motion increments from 0.6 microns down to 20 nanometers. For vertical motion, the new L-310 Z-stage delivers 26mm (1 inch) travel, minimum incremental motion to 0.1µm and velocity to 15mm/sec. 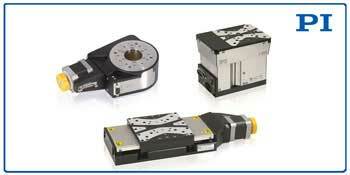 An optional linear encoder provides 50nm resolution. The self-locking design with 10kg load and a stress-relieved aluminum base guarantee excellent in-position stability. Long service life and excellent guiding accuracy with minimal backlash are guaranteed by the preloaded ball-screw drive and precision crossed roller bearings. The L-611 rotary stage provides a 35mm aperture and 360° motion and features pivot bearings for high accuracy. Resolutions up to 0.0001° can be achieved with the closed-loop version. A hardened and ground worm screw combined with a calibrated worm gear insure smooth and accurate motion. Servo and stepper motor controllers in single and multi-axis configuration are available to drive the new positioning stages. All PI controllers are supported with an extensive software package for fast start-up and easy integration into custom applications.